Dhamra: The 69th Republic Day was celebrated countrywide as well as at Dhamra Port on 26th January 2018. On this occasion Dhamra Port CEO Subrat Tripathy hosted the flag at 9 am on 26th January 2018, Friday. More than 200 defence officers joined in the joint parade. Especially the skill (art) performed by fire and defence department of Dhamra Port was tremendously beautiful and commendable. CEO Sri Tripathy and other Port officers gave tribute to the martyrs with lighting of lamp and flowers. On this occasion port workers showed and explained about the use of equipment during riot and disturbance to the public congregated on the occasion. Local students and women sung patriotic songs on this occasion. Port safety department workers performed marshal art. 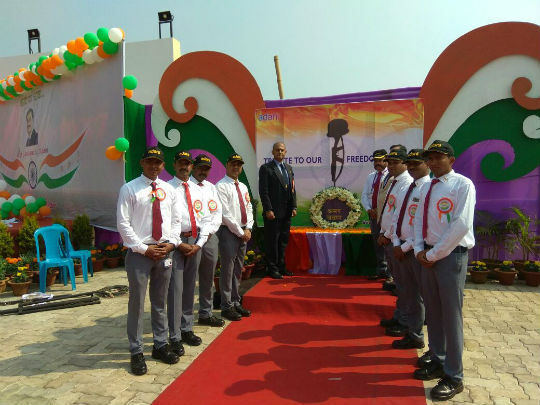 More than 600 Port officers and workers observed the Republic Day celebration. Dhamra Port safety department executed the programme well.